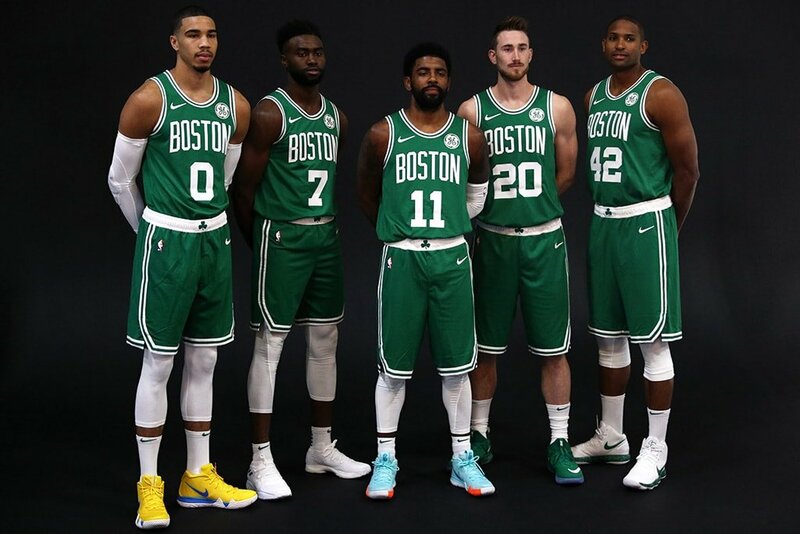 Sylver: Does The East Really Run Through The Celtics Now? LeBron James finally relinquished his iron grip on the Eastern Conference over the summer, leaving yet another burned out husk of a super-team in his wake and taking his talents to Hollywood. Whether or not LeBron makes an appearance in the NBA Finals for a ninth consecutive year is suddenly unimportant to the rest of the East. In his absence, many assume the right to play in June has been willed to the Boston Celtics. After all, that team went seven games in the Conference Finals with the Cavaliers last spring without Kyrie Irving or Gordon Hayward. Adding two healthy All-Stars to a deep mix of young talent and veteran leadership seems like a surefire ticket to the Finals. But the heir to LeBron’s throne isn’t predetermined. The executor of his estate lists one simple qualification: The best team wins, an edict that has held firm throughout NBA history (with the exception of the 2000 Trail Blazers and the 2002 Kings, playing against Shaq, Kobe and some officials wearing purple & gold underwear). Last spring marked the second time this decade that the Celtics failed to close out a LeBron-led team in the East finals after building a 3-2 series lead. While it was inspiring to watch an undermanned group get that far, one can only hope getting a grade of “incomplete” on the assignment motivates them to greater heights this season. Brad Stevens and his players also stand to face myriad personnel-related challenges. We keep saying, “depth is a good problem to have,” and it’s true. But Hayward has logged just five regular season minutes as a Celtic, and the return of him and Irving to the starting lineup not only alters the individual responsibilities of that unit, but shifts high-volume playoff stalwarts like Terry Rozier and Marcus Morris into supporting roles. And you don’t think the rest of the Eastern Conference is prepared to sit idly by, do you? While James’ defection furthered the narrative of superstars heading west, Toronto’s move for Kawhi Leonard at least applied some pressure back on the scale. It also gave an historically impotent playoff team a proven postseason performer. Toronto’s third consecutive playoff exit to the Cavs last spring may have been the worst one yet. It makes it easy to forget the Raptors, with DeMar DeRozan, held the top seed in the East from February 12th on, eventually finishing with a franchise-best 59 wins. Obviously, regular season success and the “best bench in the NBA” can’t mask the fact that the Raps won a whole four playoff series in their last five seasons under Dwayne Casey, going 2-12 against LeBron & Co. during that span. And while DeRozan’s regular season stats equaled out to 23.4 points per game on 45 percent shooting over that time, he was far less efficient in the spring, chucking at a 41 percent clip. His effective replacement, Leonard, is an NBA champion and veteran of 17 playoff series, over the course of which his team compiled a 12-5 series record – with one of those losses hastened by Zaza Pachulia assassinating his ankle. He also presided over a culture war in Basketball Utopia last year, so there’s that. If Leonard is healthy and committed to Toronto more than he was to his former employers in San Antonio, the results will be palpable. The presence of a motivated superstar (particularly one with Leonard’s defensive credentials) can alter the path of a franchise. It might even rub off on Kyle Lowry, who at times faced a similar postseason affliction to the one that crippled DeRozan. Beyond that, the Raptors’ roster after Leonard isn’t all that dissimilar from, say, the Miami Heat. Do they have another transcendent talent? Their (irritating) fanbase seems fixated on Ogugua "OG" Anunoby, a 21-year-old who defends like the dickens but is limited to rim running and spot-up three-launching on the other end. While Boston’s Jaylen Brown and Jayson Tatum appear to be on the cusp of stardom, it’s unclear if Toronto’s supporting cast is anything more than just that. Boston Celtics forward Al Horford (42) and Philadelphia 76ers center Joel Embiid (21) during the second half in game five of the second round of the 2018 NBA Playoffs at the TD Garden. The Celtics exposed the 76ers as not ready for prime time last May. Philly’s social media hashtag, #HereTheyCome, seems to indicate a renewed fervor. Joel Embiid says he’s going for the MVP Award. Other than that, and the ritual offseason reports that both Ben Simmons and Markelle Fultz fixed their jumpers, there was little non-Colangelo offseason action, with the eventual hiring of onetime inadvisable free agent signing Elton Brand to direct future free agent signings from his post as newly-minted GM. Coach Brett Brown recently said Fultz will start, moving J.J. Redick to the bench, while, to their credit, Wilson Chandler is a nice pickup who can combine with “Broad Side of a Barn” Bob Covington to give the team versatility at multiple positions. Aside from these formidable opponents, the Celtics should be prepared to encounter other familiar foes, perhaps during the April or early May portion of their presumed walk along the yellow brick road to meet the Warriors. The Bucks look like a top-half of the East team this season after putting a scare into the Hospital Celtics last spring. Milwaukee, known for its domestic brews, imported Mike Budenholzer – you may remember him coaxing 60 wins out of the perpetual also-ran Hawks in 2015 – to unlock the potential of a lineup built around Giannis Antetokounmpo. Jason Kidd had tried, but failed, and left Joe Prunty holding the clipboard. Budenholzer is being hailed as a significant upgrade. If anything, last season’s first round series showed a national audience that Khris Middleton is a fearsome running mate for the Greek Freak, and the Bucks can cause some problems. The Pacers proved they were equally capable of giving the Cavs a fright, going to seven games in round one. They’ve added Tyreke Evans to a Victor Oladipo-led unit that gave the Green fits in the regular season. Speaking of teams that give Boston a hard time, the Wizards are still kicking around; they still employ John Wall and Bradley Beal (who are still unbelievably just 28 and 25 years of age, respectively), and they’ve added Dwight Howard. And the Heat could always trade for Jimmy Butler. We’re on the cusp of game one, with eighty-one to follow and hopefully plenty more as Boston comes back to life in the springtime. Happy NBA New Year, everybody. Just be cautioned, like the Red Sox this season, any goodwill this team generates in the next six months means little if they fumble away a postseason opportunity. Danny Ainge’s overhaul has reached year six, with a third consecutive trip to the Conference Finals in sight. The expectations that were ground to dust last year with Hayward’s ankle and Irving’s knee are back on, perhaps heightened by the plaudits heaped upon the plucky bunch that nearly prematurely ended LeBron’s Eastern reign. With the Celtics donning resplendent regal robes as an early favorite, let's see if they're ready to hold the crown.